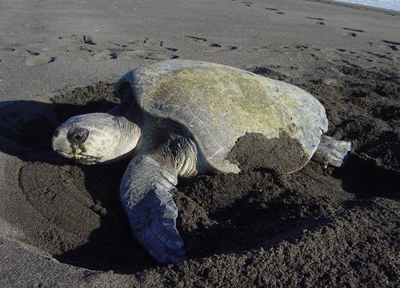 Olive ridley sea turtle nesting on a beach in Guatemala. Photo courtesy of Scott Handy, Pacuare Reserve, Costa Rica. Sea turtles are found throughout the ocean, except in cold, polar waters. At present, we do not have any reliable underwater recordings of sounds produced by turtles, nor do we know how well most sea turtle species hear sound either in air or underwater. Our best data regarding sea turtle hearing come from studies using auditory brainstem responses(ABRs). From this work, scientists do know that sea turtles can hear low to mid-frequency sounds, but with poorer sensitivity than mammals. Sea turtles appear to hear best between 200 and 750 Hz and do not respond well to sounds above 1,000 Hz. To determine the hearing capabilities in an adult green sea turtle (Chelonia mydas), researchers obtained a behavioral audiogram for an older female green sea turtle, “Myrtle”, housed in the New England Aquarium’s Giant Tank exhibit. 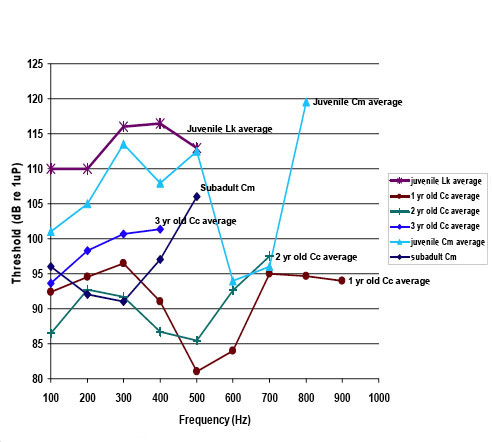 Based on her responses, it was concluded adult green sea turtles hear best between 200Hz-500Hz. The opening into a sea turtle’s ear is covered by thick skin, known as the cutaneous plate, which is a ring of scales that are similar but smaller than those on the rest of the head. Below this skin is a fatty (subcutaneous) layer. The thick skin and a fatty layer make it difficult for the turtle to hear well in air, but provide good tissue conduction for underwater sound to the middle ear and inner ear. Audiograms for the green turtle (Chelonia mydas; Cm), kemp’s ridley turtle (Lepidochelys kempi; Lk), and the loggerhead turtle (Caretta caretta; Cc). Audiograms are determined from Auditory Brainstem Responses (ABRs). Turtles do not hear well above 1,000 Hz or below 100Hz. Most sea turtles hear best between 200 and 700 Hz depending on the species and age of the turtle. From Ketten and Bartol (2005). Sound is important in the marine environment and fishes have developed sensory mechanisms for detecting, localizing, and interpreting sounds. Two independent but related sensory systems used by fish to detect sound are the inner ear(the auditory system) and, to a lesser extent, the mechanosensory lateral line system, which is generally used to detect vibration and water flow. The bodies of fish have approximately the same density as water, so sound passes right through their bodies, which move in concert with the traveling sound wave. Fish have bones in the inner ear, called otoliths, which are much denser than water and the fish’s body. As a result, these ear bones move more slowly in response to sound waves than does the rest of the fish. The difference between the motion of the fish’s body and the otoliths bend or displace the cilia on the hair cells that are located in the inner ear. This differential movement between the sensory cells and the otolith is interpreted by the brain as sound. Otoliths are made of calcium carbonate and their size and shape is highly variable among species. Sensitivity to sound differs among fish species. One factor affecting this is the proximity of the inner ear to the swim bladder. The density of the gas within the swim bladder is much lower than that of seawater and the fish’s body. As a result, the gas in the swim bladder can be easily compressed by sound pressure waves. The swim bladder changes in volume cyclically in reaction to passing sound waves. If the movements of the swim bladder wall are transmitted to the ear, this results in the stimulation of the hair cells of the inner ear. Species lacking a swim bladder (e.g. elasmobranchs), those that have a small or reduced swim bladder (many bottom-dwelling species, including flatfish), or those that have a swim bladder that is not in close proximity, or mechanically connected to the ears (e.g., oyster toadfish) tend to have relatively poor auditory sensitivity, and generally cannot hear sounds at frequencies above 1 kHz. In contrast, fishes with swim bladders that are in close proximity to the inner ear and/or are connected to the inner ear (e.g., they have an otophysic connection), have increased hearing sensitivity. Such fishes can hear up to 3 kHz or more. Sound pressure waves passing through water also creates particle motion close to the source of the sound. Fishes have organs called neuromasts on the skin or in canals below the skin’s surface. These are composed of hair cells, like the inner ear. They detect the relative motion between themselves and the surrounding water. Fishes can use the lateral line system to detect acoustic signals at short range, over a distance of one to two body lengths, and at low frequencies (lower than 160 to 200 Hz). Neuromasts are located on the skin (superficial neuromasts) or in canals (canal neuromasts) on both the head and body. In the lateral line canals, neuromast organs are located in linear series, with one organ between two adjacent canal pores. The pores link the outside environment to the fluid inside the lateral line canals where changes in the flow field (water movement) around the fish are detected. The cilia of all of the hair cells in a neuromast are embedded in a gelatinous cupula. Water movements within the canal, caused by water flows outside the canal, cause the stereociliary bundles of hair cells to bend alerting the fish to nearby movement. How do marine invertebrates detect sound? Marine invertebrates, such as this spiny lobster, sense vibrations that are produced from underwater sounds. Photo courtesy of Sheila Patek. Although marine invertebrates do not hear in the same way vertebrates do, it is thought they are able to sense vibrations and movements associated with sound production. Some marine invertebrates that produce sound in air have specialized sensory organs that can detect acoustic pressure changes in air. However, marine invertebrates in water are known to detect only particle motion. External sensory hairs and internal statocysts aid marine invertebrates in sound detection. Most marine crustaceans (e.g. lobster, crabs, and shrimp) have an extensive array of sensory hairs covering their bodies. Water- or substrate-borne vibrations associated with changes in acceleration, hydrodynamic flow, and/or sound, may stimulate these sensory hairs. Detecting these vibrations may help animals sense the movements of other nearby organisms. Researchers found sensory hairs located on the claws of the Australian freshwater crayfish to be most sensitive to water vibration frequencies between 150-300Hz. Sensory hairs found on different body parts of the American lobster can detect low frequency, underwater sounds from 20-300 Hz. The statocyst is a complex sensory organ found in most marine invertebrates. It primarily provides orientation cues that allow an animal to maintain its position in the water column. Some researchers believe that the statocyst may also function to detect the low frequency, particle motion component of sound. All cephalopods, except the nautilus, have a statocyst. Auditory Evoked Potential (AEP) studies (with electrodes placed near the statocysts) showed longfin squid responded to sounds between 30 and 500 Hz. The animals were most sensitive at frequencies between 100 and 300 Hz. Auditory brainstem response (ABR) studies found oval squid and common octopus to be sensitive to sounds from 400-1500 Hz and 400-1000 Hz, respectively. In other studies, where the sensory function of a cephalopod statocyst was either chemically blocked or surgically altered, sensitivity to acoustic stimuli was not observed. Many marine crustaceans also possess statoycysts, usually located on their first antennae. Using ABR techniques (with electrodes positioned on the antennules), researchers found the statocyst of the common prawn to be sensitive to sound waves ranging in frequency from 100-3000 Hz. Similar to work performed on cephalopods, when statocysts were removed from some of the prawns, sensitivity to acoustic stimuli was no longer observed. Some marine invertebrates possess other sensory organs that can detect vibrations transmitted through the substrate (“seismic signals”). Chordotonal organs are generally associated with the joints of flexible appendages (e.g. walking legs and/or antennae) and are connected to the central nervous system. Movements or vibrations transmitted through the substrate can stimulate the chordotonal organs. Specialized Barth’s myochordotonal organs (Barth’s MCO) are found in semi-terrestrial fiddler and ghost crabs. Externally, the organ can be identified as a distinct, thin-walled “window” in the exoskeleton on each leg. In ghost crabs, this sensory organ is receptive to both substrate-borne and airborne sounds, while in fiddler crabs, it responds primarily to substrate-born vibrations.